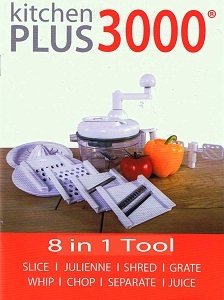 Kitchen Plus 3000 is a special machine which can cut any kind of vegetables, like carrots, lettuce, cabbage, etc. This machine contains heavy duty blades, which can cut ten to twenty times faster than by hand. You can use it to make your own salsa, sauces, salad, or anything you like to make! Simply insert either blade or paddle in the center of the bowl, then cover with top cabinet and turn clockwise. More turns make finer cuts. 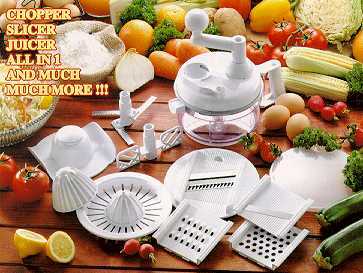 Attach multi-functional base to bowl and insert whatever function you choose, either to slice, grate, julienne or shred. Make sure to use Safety Holder at all times. Great for chopping and dicing tomatoes, onions, garlic, peppers, celery, nuts, mushrooms, and the like. Works well for fruits as well as zucchinis, eggplants, cucumbers, potatoes and much more. Squeezes fresh orange, grapefruit and lemon juices. Zests oranges, lemons and limes for flavoring and embellishing. Can also be used for ginger and garlic. Shreds cabbage, lettuce, carrots, cheeses and other salad ingredients. 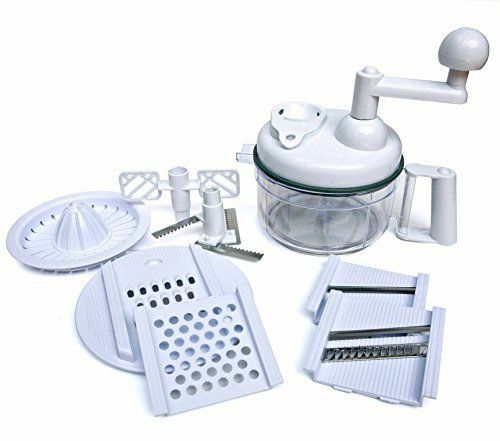 Used for french fries and healthy vegetable sticks. Scrambles eggs, whips cream and blends cake batter. Place the storage lid on the container for refrigerator storage. We made salsa in this tonight for the first time. I forgot we had it and had never used it. It was easy to use. I dumped whole cilantro stems, jalapenos, garlic cloves, & diced tomatoes and it chopped them up into perfect salsa! We love it.